After 18 physical therapy sessions at the rehab center and more done at home, I felt my left shoulder was becoming stronger. However, the dull nagging pain just wouldn't go away. Every few days, I'd occasionally perform some of the shoulder mobility and strength tests I know like the Hawkins test, Neer test, Yergason test, Drop Arm test, Crossover test, Yocum test, Empty Can test and a few others. I always tested positive on the Empty Can test and it was painful at that. I followed this up with the rehab doctor because the physical therapy exercises were no longer helping. He directed me to proceed with getting an MRI (Magnetic Resonance Imaging) examination done on the left shoulder. I've been delaying this procedure for its cost and the hope that physical therapy was enough. So I met with the rehab doctor to get a request slip for a Left Shoulder MRI (Plain). The procedure is plain in that there is no need to inject a dye when getting the MRI. Knowing my concerns on the cost of MRI, the rehab doctor gave some names of hospitals where I might get the shoulder MRI for a cheaper price. Some of the hospitals he mentioned were Calamba Medical Center, Delos Santos Medical Center, Makati Medical Center and UP-PGH. He estimated that UP-PGH was the most affordable at Php 5,000, but this was many years ago. He quickly cautioned that there were diagnostic clinics and "medical centers" in front of known hospitals that had very inexpensive MRI. He was wary of them though and advised to stay away from them. A quick call to UP-PGH informed us that their MRI machine has been non-operational for a few years and instead referred us to a center within UP-PGH compound called FMAB (Faculty Medical Arts Building) that outsources the MRI procedure. Their cost for a shoulder MRI is Php 6,142.50. There is an additional cost of Php 800 for the MRI plates or film. The Calamba Medical Center quoted Php 9,315 for the procedure while the one at Delos Santos' Hospital charges cheaper at Php 9,200. MRI at Makati Medical Center cost a little above Php 7,000. Although the FMAB facility was far from our place, they apparently had the more affordable MRI fees. We would learn later on that the FMAB facility is run by a private institution called UPMC or University Physicians Medical Center. The place has been extensively renovated and is very impressive with state-of-the-art medical equipment and facilities. 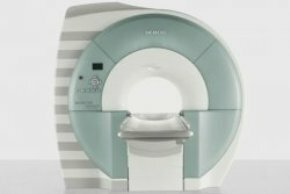 The MRI machine is at the ground floor and UPMC boasts a 1.5 Tesla MRI scanning machine Magnetom Essenza by Siemens. Below is the photo of the MRI machine from the UPMC website. My call slip for the MRI scan was supposedly at 2:30 pm but we were entertained at 3:30 pm already. I could only assume they had more patients that day. We didn't mind waiting though. The place is clean and well-lighted though a little cold. They had newspapers and a movie to keep you occupied. Finally, after a brief interview, I was led by the MRI technologist to the MRI room. I was asked to remove all metal pieces I had with me - eyeglasses, wallet, etc. I was asked to lie on a bed that slides inside the tunnel of the MRI machine. I had a panic switch button which I held in my right hand to alert the MRI technologist in case of emergency. My ears were fitted with a pair of headphones with music playing in them. This was supposedly to drown the MRI noises and distract you from the MRI procedure. There was also a white cuff device that covered the entire left shoulder area as shown below. I must admit that the MRI scan procedure was a bit more unnerving than I thought. It can become very claustrophobic once inside the machine because the tunnel's celing was just a few inches from your face. And I was unlucky in that the music in my headphones stopped playing halfway the entire procedure. So I had to endure much of the MRI noises which had clanging and banging sounds. I could just describe them with the sounds you'd hear in a construction site. 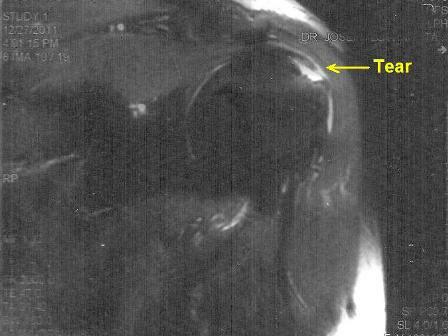 There were, in all, 80 images in the 4 MRI films, but the one that ultimately had the orthopedic surgeon's attention was this image of my left shoulder as seen from the front. Without even looking at the interpretation of the MRI radiologist, the Orthopedic surgeon also interpreted the MRI results as showing a partially-torn rotator cuff primarily based on the above MRI image. May i ask you? Do you think delos santos hospital is okay for the mir procedure? I mean, can i rely 100% for their machine? I've not actually gone to delos santos hospital, as it's far from where I live. We did ask though for their MRI fee as I posted above - please call to verify. I could not vouch for their procedure, but my rehab doctor mentioned delos santos in his list of recommendations. FMAB is still the cheapest I found - and they have a nice facility. Their MRI machine also looks new. Hi. Thanks for your helpful post. May I ask if what happened after, what healing measures did you pursue on that tear? If you can share please. Thanks. The only treatment that was practical was arthroscopic surgery. I had the surgery which cost me Php92K (net of philhealth). I'm happy to say my operated left shoulder is now in BETTER shape than my right shoulder. Hi. Where did you had your arthroscopic surgery? Without Philhealth how much should be the cost? My surgery was done at UPMC. The surgeon initially quoted Php120K as the amount to prepare. At the day of the operation, he cautioned that he may need suture anchors (screws to hold up muscle tissue to facilitate healing) to put in my shoulder. Each anchor cost almost Php7,000! The medical contractor (supplier) was there with the anchors and equipment just in case I needed them. Fortunately, I didn't need them for my shoulder. Without Philhealth, the total cost would've been just a little over Php100K but didn't reach Php120K. Are you planning to have surgery? What's your condition? Hi black dove. Can i ask you some questions regarding your procedure, recovery etc. I have also problem in my left shoulder. Can i email you or email me at v-perez@mitsubishi-motors.com.ph or text me at 09369207055. Thank you very much. Hi Von Eric. You may post your questions here in this blog. I'd be happy to entertain your queries. Hi sir. How long did you stay in the hospital after surgery? After recovery does your shoulder get to its normal shape like before? In my case, my shoulder is having reccurring dislocation. Its like it was unstable. Some positions i cannot do. My arthroscopic shoulder surgery is an outpatient procedure. I was to stay for half-day. But because additional liquid paracetamol was administered because of the pain after surgery, I overslept and woke up almost 7pm. I got out of the hospital around 8pm. I didn't stay overnight at the hospital. Full recovery really depends on the patient and the rehabilitation. In my case, I didn't get PT until the 2nd week after operation. I think it should be less than a week after the operation. My first PT wasn't successful. I had to get another set of PT sessions from another Rehab clinic. So be sure to see a good Rehab doctor after surgery. After full recovery, the shoulder was in BETTER SHAPE than before. Yes, I too felt instability in my left shoulder before the surgery. Even while walking, I felt the shoulder joint is loose - like it would dislocate and then also felt a dull pain. Sir how did you inquire to UPMC? By the way, is it the one located at Taft manila? Can you advice the step by step procedure, i am now decided to proceed with the surgery. Thank you again sir. UPMC was suggested by my Orthopedic doctor who's also a surgeon. UPMC has relatively new facilities (at least as of 2012). Yes, that's the one in Taft in the PGH compound. Others call it FMAB. Am curious. What possibly led you to this shoulder condition? What is your line of work? How old are you? Do you have the go-signal for the surgery? Have you had your MRI interpreted by an orthopedic? You also need to be cleared for surgery. It happened i think 2007. While i was playing basketball. That was my first dislocation. Then i rest it for about 6 months. Then until now it doesnt return to its stable at strongest condition. I have consult a sports doctor, at the megaclinic at sm megamall. The doctor told me to have an mri then i took the mri at the cardinal santos (cost about 13k) then take the results to my doctor and the findings was a tear that causes unstability and reccurent dislocaton. My doctor told me that it was subjected for arthroscopic surgery. Then i ask for an estimate and he gave me 220k for the surgery. I was shocked because of the estimate was very high. For the operating room only at the cardinal santos it cost about 100k. Thats why when i see your expenses in your surgery i am very much interested because it was low. That IS expensive. It's like double what I paid for. Even the MRI cost is almost double. But if that's the prognosis, then opt for the surgery. For me, the instability isn't life threatening (as mentioned by my doc), but I'd hate to be miserable all my life. Remember, you will also need physical therapy sessions. My first series of therapies was botched because the sessions weren't consistent (too few and far in between). When I returned to the orthopedic, he was a bit dismayed that it wasn't healing properly. If fibrosis would set in, another procedure called Manipulation would need to be done. I went to my former Rehab Doctor (in Las Pinas) and her therapists did a good job in correcting and treating the shoulder. Although the initial sessions were extremely painful for me, my left shoulder fully recovered. Good luck. If you have more questions, just post. Yeah for me as well. I cant even do some stuff because of its instability. I cant even swim properly because if i rotate my left arm at the water, it will surely dislocate. Yeah it was doubled thats why when i see what you have paid i am very interested. Can i just go directly to the UPMC? What was the name of the doctor i will be looking? Also do i need to set an appointment or jist go there? Yeah, the doctor who checked me up advised that after surgery there are some series of recovery and strengthening therapies. When you go back to your rehab doctor and corrected the therapies, how long the therapy was (i mean how many sessions it lasts) also how much is the therapy. If the cost will be the same with you, i am decided now to have my surgery done this january. Yes, I think they have doctors at UPMC who can look at you. The orthopedic surgeon I consulted with is Dr. Nilo Paner, although my consultations with him were at his clinic hours in Alabang Medical Center in Muntinlupa. I think he has clinic hours at UPMC also. I don't know how consultations are in UPMC. Call them. They will probably give you schedules of their available orthopedics and then you can choose a schedule convenient to you. The second rehab doctor I went to initially suggests 12 to 18 sessions at twice or thrice a week. At the end of that set, she may add more, depending on your recovery. My rehab doctor is Dr. Betty Mancao, a veteran in the field. She's my suki in my other past therapies (lower back, right hand, left and right shoulders). She charges 350 for consultation. Although each PT session is 300, still higher than the ones I had in Muntinlupa, her therapists are more consistent with the schedules. Where did your mom undergo surgery? How is she doing now? Yes, from what I remember, that was the cost - Php 7K. I could be wrong, but that is what I remember. I also remember the surgeon asking me to prepare Php 21K as I might need 3 anchors at the most. Fortunately, I didn't need any, so I never paid for them. This was way back in 2012. Yes. After showing the MRI request from doctor, and paying, you'll be scheduled for the MRI. Meron po bang shoulder MRI with contrast at magkano po? I only had the plain MRI. I've no idea on the cost of MRI with contrast. hello po,maganda po ba ang MRI sa PGH?mama ko po kasi nirequired din ng doctor,yung iniinda nya sa leg nya. Hi Nash. Yes, the facilities they have at the FMAB in PGH are good. This at the time when I had my shoulder MRI in 2012. 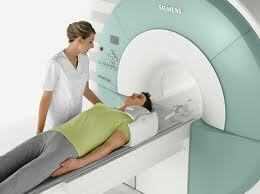 However, you need to prepare your mom on the MRI procedure itself, because the procedure can be unnerving. Hi Blackdove! If I may ask a question, where did you go for your Rehabilitation? I'm just not sure where to go here in Las Pinas area. Hi Jean Paul. For rehab, I went to Casa Medica in SM-Southmall. I consulted with Dr. Betty Mancao. She's very good and one of the best in the field. They also have a team of physical therapists at the rehab clinic. I just don't know if Casa Medica is still there. So, do ask around or call SM-Southmall. Thank you so much! I really appreciate it! I'll definitely check it out. Hi ask ko lng po if mgkano po pag MRI sa Mata plain lng po. Magkano po kaya? Sorry, no idea on eye MRI.